Favourite Plants is the ideal book for Canadian gardeners looking for perennials, roses, trees and shrubs to suit their particular locations, from Zone 3 to the warmest climates in the country. 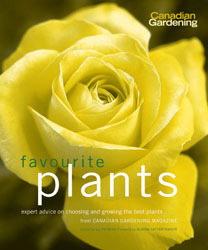 It includes planting and growing advice for dozens of the country's most wanted plants, plus detailed descriptions and information about the most desirable varieties and cultivars available, all from the personal experience of expert Canadian writers and gardeners. The lush photographs will inspire every gardener who opens this book, and the professional writing will entertain and inform.